I’m delighted to welcome Julie Ryan to my place today. We are chatting fiction, the Greek Islands and romance. 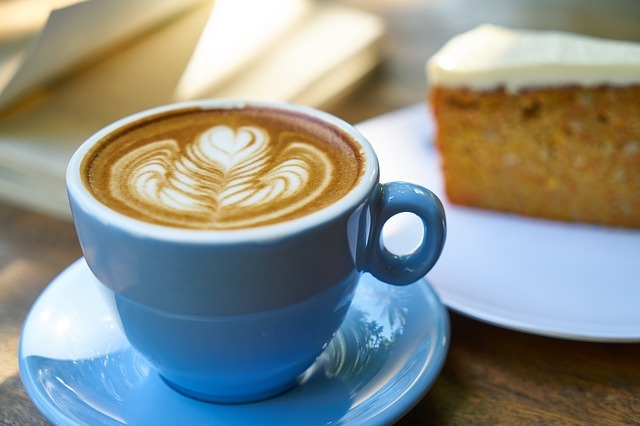 Grab a cuppa and come and join in! I lived in Greece in my twenties but it wasn’t until I was at home in Gloucestershire years later that I idly began to wonder how my life would have been different if I’d stayed there. I began writing what I thought would be a short story but ‘Jenna’s Journey’ took on a life of its own. I love the idea of ‘What if..?” and gave my book a kind of ‘sliding doors’ double ending. A lot of my friends look at my characters to see if they can see themselves in my books. The truth is I may take an element from someone I know and then mix it with the looks of a person I’ve seen on TV and the voice of someone I overheard on the bus. I don’t consciously base my characters on anyone I know but if you look closely enough you may find just a little bit of you in there. I chose to base my book on what I know so that’s why it’s set in Greece in 1987. I didn’t have the opportunity to go back and see how Greece has changed so I deliberately set the story on a fictional island. I did do a lot of online research into Greek customs as well as getting out all my old photos and a map of Athens from the period. I think setting it during the time I lived there gives the book a sense of authenticity that I wouldn’t have got by just Googling it. It really depends. I chose third person for most of Jenna’s Journey but sometimes find myself using first person too. The characters and storyline usually decide for me as I often find that I need to switch person if it’s just not working. Third person is useful as the narrator can tell the overall story from different characters’ points of view, whereas first person means you are usually limited to just one character. I like to have a general idea of where the story ends and then throw in a few characters and a setting and see where it takes me. I can’t possibly plan out all the novel in detail chapter by chapter as it wouldn’t be a surprise to me either. I rather like not knowing where the story is going but it does mean a lot of revisions! I write when I can and wherever I can. In practice this usually means in the morning at my dining room table once my son has gone to school. I fit it around teaching and am lucky that I work from home. As I’m nearing the end I may take my laptop to bed and write for an hour or so. I also write longhand in a notebook on long car journeys. It really is a case of when inspiration strikes – write! The opposite is also true. If I have writer’s block there is no point just looking at a blank page – I just get on with something else. Finishing it! I’ve always been a reader and admired writers for the pleasure they bring. I never actually thought I had it in me to finish a book. Seeing it in print ranks up there as one of the top three moments of my life, after my wedding and the birth of my son. 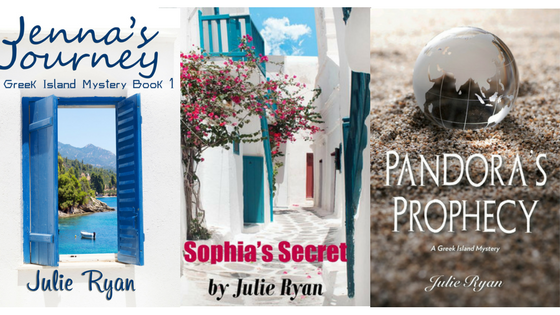 It’s hard to believe that I’ve now written four books in total, three in the Greek Island mystery series and a Christmas humorous romance. Heading to the Greek Isles without telling husband or friends is heady medicine for a failing marriage. Seduced by Grecian sun and sky, Jenna innocently obtains an ancient urn that tangles her into a web of a criminal world more sinister then she could ever have imagined. Romance is always afoot in the Greek Isles and Jenna gets a large helping with the seductive Nikos. Twenty-five years later, Allie takes this same journey in a story that spans 25 years and intertwines the lives of mother and daughter. Twisty as the streets in a Greek island village, full of unexpected characters and threatening villains, Jenna’s Journey will keep you turning pages far into the night. Jenna’s Journey is the first novel in Julie Ryan’s Greek Islands Series, a series she did not set out to create but which took on its own life and grew, rich and fascinating. This is the first of three published so far and promises to delight readers looking for the hidden dark sides of dream vacations in the Greek Isles. In a new venture, Julie’s latest book is a short rom-com called Callie’s Christmas Countdown. Many thanks Julie. Do drop around for coffee and cake again! 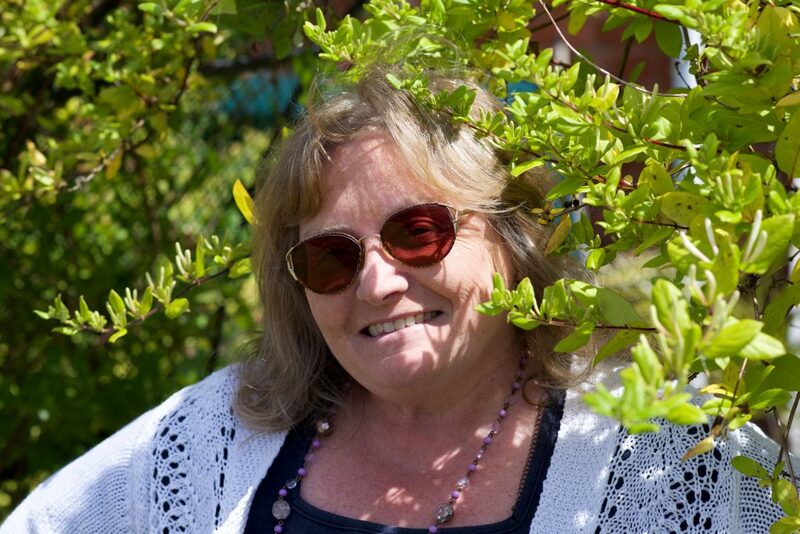 Thanks so much for hosting me – lovely blog.